Hi there! 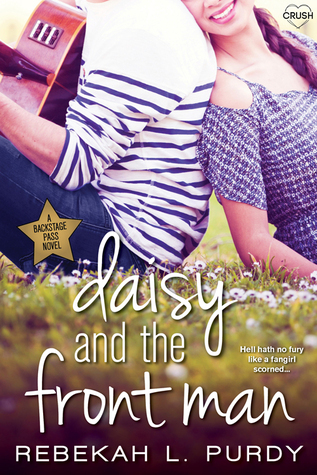 Today I get to share my review for DAISY AND THE FRONT MAN a contemporary teen romance from Rebekah Purdy. This is the third story in the new Backstage Pass series coming out of Entangled Teen Publishing–one about each member of a boy band falling in love. I recently read and liked MIA AND THE BAD BOY, the second book. Though it’s a series, each book is a standalone, swoony tale. I’ve read other books by Ms. Purdy (HOW TO UNBREAK-UP and THE ROMEO CLUB) and enjoyed her breezy style, so I was anxious to get my hands on this one! Don’t forget to scroll down and enter the $50 Amazon gift card giveaway! Daisy is a fangirl scorned. She won a contest for the band Seconds To Juliet and her prize was a date to homecoming with S2J’s front man Trevin Jacobs–thing is, the dude stands her up–in front of half her town. Yep. She’s a pariah. So, she’s more than toying with the idea of humiliating Trevin when she joins her father on the S2J tour. He’s the chief bodyguard for the band, and Daisy has unlimited access. Trevin is a bit of a jackass. He’s a narc on his bandmates and charged with keeping everyone in line, even though he’s only 18. Still, meeting Daisy has him re-considering the S2J “no girlfriends” policy, and fellow songwriter, Ryder, challenges Trevin to the ultimate bet: if Trevin can get Daisy to fall for him, then he can get special songwriting privileges for the band. It’s Trevin’s dream-come-true—get a pretty girl to love him and he’s set! Thing is, Daisy is not at all inclined to swoon for Trevin. She’s too bitter. Trevin can’t understand why his normal schtick isn’t working and actually tries to get to KNOW Daisy–he’s smitten, and feeling rather crappy regarding the bet. For her part, Daisy sees how kind and considerate Trevin is, and thinks maybe her revenge plan is not the way to go. Plus, reconnecting with her dad after several years’ absence gives her a better perspective on life. She thought all men would leave her abandoned: Trevin, her dad, her dead Gramps. Trevin seems earnest in his pursuit of her friendship (and More!) until Daisy learns about The Bet. So, this is a clean read with just a few make-out sessions. Daisy and Trevin are both young and foolish, making bad choices they regret and seek forgiveness for. It’s a solid YA romance with relatable, imperfect MC’s who make amends and build a real relationship. There is plenty of caustic banter and some definitely swoony moments. I enjoyed. Interested? You can find DAISY AND THE FRONT MAN on Goodreads, Amazon, Entangled Teen and Barnes & Noble. I received a review copy via NetGalley. 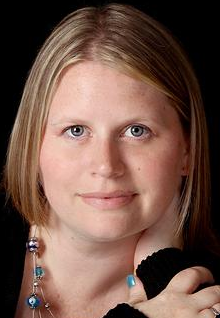 You can catch up with Rebekah online on her website, Facebook and twitter. I like your review style. While I must admit that YA doesn’t usually interest me unless magic or aliens are involved, I like that this book and series is centered around the music industry. Sounds like a good read to recommend to a few teens I know.